• Download Machine Readable Passport Application Form from here. • Click link Here and click passport application forms in PDF format (bottom right hand side). It will open into a document written in the Nepali language. This is the instruction given for filling the application form. Scroll all the way down and click on the last sentence (left aligned) which appears in blue colour. • Scroll all the way down and click on the very last sentence which appears in black. An application form in English appears in a separate page. • Fill out the form very carefully giving every information asked for in the form. Write the surname and the given name exactly the same way as in his/her old passport. Be very careful with the spelling of name. Give one space between Given name, middle name and surname (family name). 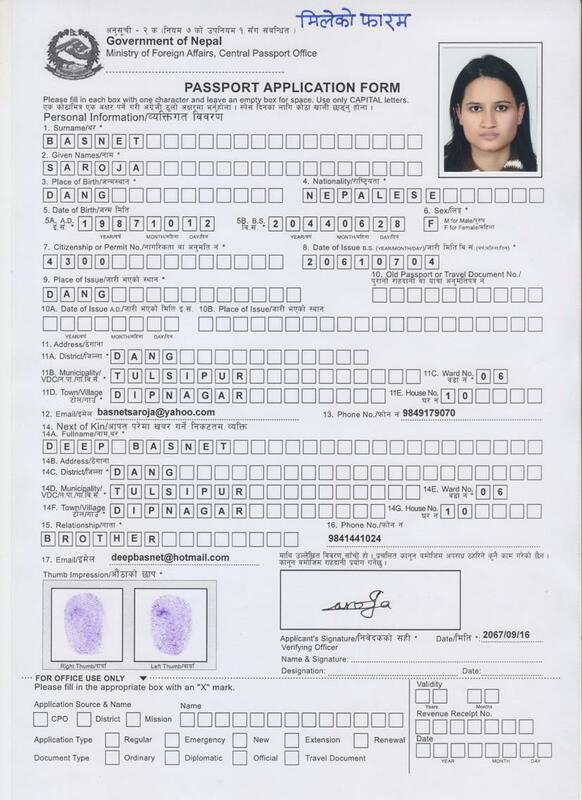 • Print out the form, glue the passport sized photograph onto the form, neatly imprint the left and right thumb impression at the bottom and ask the worker to sign the form inside the signature box. The signature should be full and very clear, to be done in black ink. If the worker cannot put his signature, put a cross (x) mark in the signature box. • Click here to view Wrong way OR here to view Right way of filling up the MRP form. 1. It should be a colour photograph taken within six months. 3. Background: plain light coloured background. 4.1. The lighting must be uniform with no shadows or reflections on the face, eye-glasses or in the background. 4.2 The subject’s eyes must not show red eye. 4.3 The photograph must have appropriate brightness and contrast. 4.4 The lighting and photographic process must be colour balanced to render skin tones faithfully. 5.1 The photograph should show the subject facing square on and looking directly at the camera with a neutral expression and the mouth closed. 5.2 The face should be in sharp focus and clear with no blemishes such as ink marks, pen, pin, paper clip, staples, folds, dents, or creases. 5.3 Some portion of the shoulders and whole head should be visible. 5.4 Both ears should be clearly visible. It should show a close up of the head and shoulders. 5.5 The subject’s eyes must not show red eye. 5.6 There must be no other people, chair back, or objects in the photograph. 5.7 The subject must not wear brightly-coloured dress. 5.8 The face should occupy 70 to 80 per cent of the photograph. 5.9 The picture should be printed in high-quality photographic paper with high resolution. 7. Headdress, etc. : Except for religious or medical reasons, coverings, hair, headdress, hats, scarves, head bands, bandanas or facial ornamentation which obscure the face, are not permitted. In all cases, the person’s full facial features from bottom of chin to top of forehead and both edges of the face must be clearly visible. Template to measure the photograph for MRP application as required by ICAO (International Civil Aviation Organization) can be downloaded from here. ICAO template or actual size form (actual-size) can be printed on a plain sheet of plastic paper for measurement. • Each applicant should submit citizenship certificate along with old passport to receive a new Machine Readable Passport. • The new machine readable passport will have a validity of 10 years. Passport for the children under ten years will be valid for only two years. • Fee for the issuance of the machine readable passport is RM 210. In case of tampering, mutilation and loss of passport the fee will be double that amount, i.e. RM 420. However, the passport renewal fees for the Nepalese living in Philippines and Indonesia will be RM 310 for renewal and RM 620 for extension. • Once a machine readable passport is issued, it is not possible to amend any particular of the bearer. 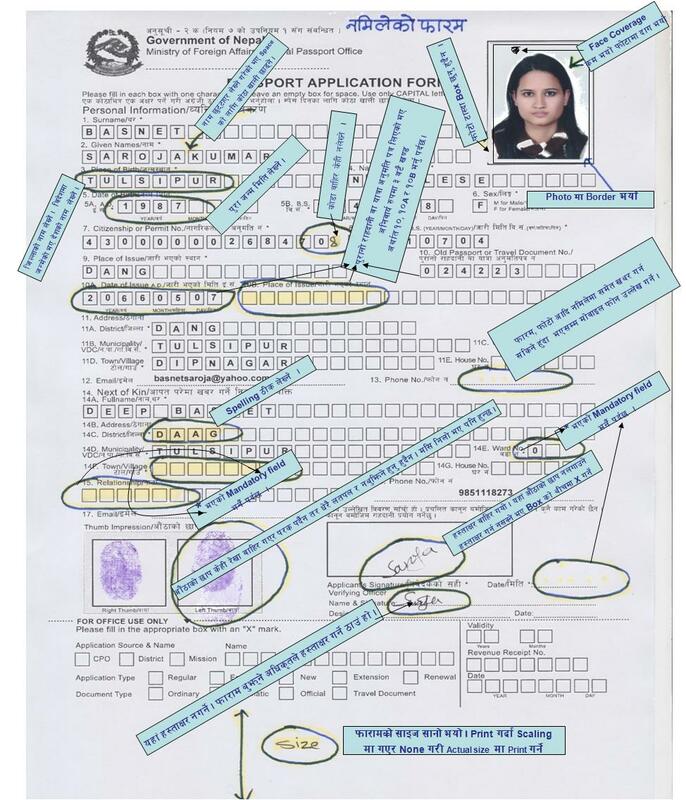 Therefore, process for issuance of a new passport has to be initiated once again if there are mistakes in the picture, signature and particulars given by the bearer of the passport. Thus it is very important to prepare the application carefully so as to avoid mistakes and inconsistencies.